Use it as a media center or to install a Web browser. 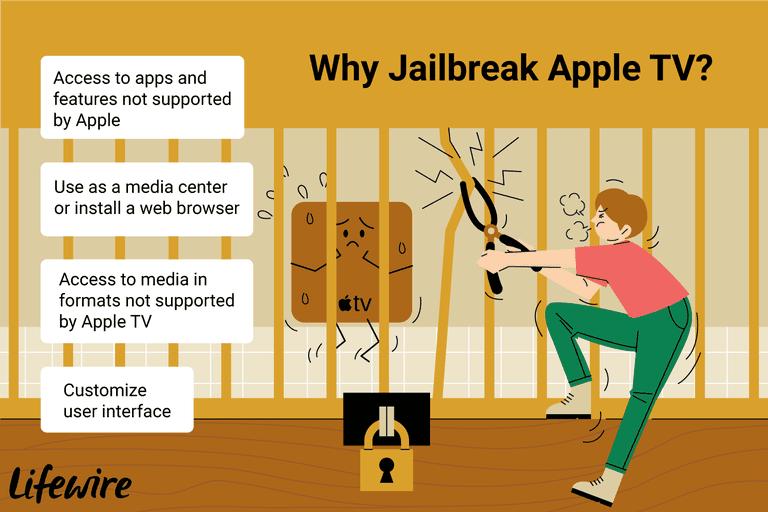 However, unless you have a huge collection of media on your own personal media server, you may not need to jailbreak at all. Jailbreaking is the name for when you install an unofficial, unsupported OS software on your device. Once your Apple TV is jailbroken, you should be able to install a range of usually unsupported new apps, services, and systems to the device. Disclaimer: Be warned that jailbreaking your device is against Apple's terms of service and will void your warranty. Proceed at your own risk. What Apple TV Models Can I Jailbreak? The second-generation Apple TV is the jailbreaker’s choice. Older models are hard to find, while fourth and third-generation Apple TV’s can’t easily be jailbroken. There are some online services who will promise to break those models for you in exchange for a fee, but they will take your money and be unable to complete the task. Tip: If you are using a more recent Apple TV model then you may want to use it with Plexconnect and Plex Media Server or Firecore’s InFuse. These solutions will at least let you access a wider range of media formats if used with a media server. Firecore Seas0nPass provides an untethered jailbreak of the 2nd gen Apple TV running iOS Firmware 5.3 (released 19 June 2013). It is one of the most reliable ways to jailbreak your Apple TV. Download the Firecore Seas0nPass software to your computer (Mac and Windows versions are available), uncompress it and move it to your Applications folder. Next, connect your Mac/PC to your Apple TV using a USB Micro cable. Now launch Seas0nPass and click Create IPSW, you will be prompted to press the Menu and Play/Pause buttons on your Apple TV remote. iTunes will launch on your PC/Mac and begin restoring your Apple TV, it will also find and open a series of files on your computer to enable this. Once this operation completes, click Done and you will be able to remove the cable, connect Apple TV to your TV and switch it on. You should see the FireCore logo appear as the Apple TV boots up, you may also spot it when it temporarily appears to replace the Settings icon on the Apple TV Home Screen. You can also use Seas0nPass to install a tethered boot. This isn’t as convenient as it means you will need to connect Apple TV to a computer each time you want to start it up. It is the only way to install Seas0nPass on an Apple TV running iOS Firmware 6.2.1. Once you’ve jailbroken your device the simplest way to begin making use of it also comes from FireCore and is called aTV Flash. Macworld says aTV Flash, "Turns the Apple TV into a powerful media center for your living room." The software costs $29.00 and gives you almost everything you need to add a host of different features to a jailbroken Apple TV 1 or 2, including Web browsing, support for multiple media formats (including AVI and more) and the capacity to install applications such as XBMC. It also provides a weather widget, news feeds and a range of other handy tools, while also allowing you to access all the usual Apple TV features you enjoy. You will need a USB flash drive and must follow these instructions. Do You Need to Jailbreak? If you own a recent Apple TV model you may feel there’s no pressing need to jailbreak your device because so many of the features you gain from jailbreaking your system are now made available by tvOS apps. However, if you have an older unit around it may still make sense. Jailbreaking Roku – Is it Possible? Can You Jailbreak a Roku Express?